Il Divo, the acclaimed new film from Paolo Sorrentino (Winner Jury Prize, Cannes Film Festival 2008; Winner Best European Actor – Toni Servillo – European Film Awards 2008; Film on the Square – London Film Festival 2008) is released on March 20th and to celebrate we present our guide to the top ten gangster films of all time, as chosen by the American Film Institute. The classic gangster film, ranked number 2 of the IMDB’s top 250; based on Mario Puzo’s best-selling novel, it was critically acclaimed upon its release and consistently tops greatest film lists. Though hardly the first gangster film, Francis Ford Coppola’s sympathetic treatment of the Corleone family, despite their habit of chopping off horses’ heads and leaving them in people’s beds, and his portrayal of gangsters as individuals rather than stereotypes paved the way for the films of Scorsese and television shows like the Sopranos, as well as creating cultural archetypes through its depiction of the Mafia as a feudal organization with the Don as the king. It features superb performances from Al Pacino and Marlon Brando (who won an Oscar), and is a universally adored cinematic masterpiece. The story of Henry Hill (Ray Liotta), a man who, growing up in a blue-collar Italian neighbourhood in Brooklyn, has ‘always wanted to be a gangster’, Goodfellas is noted for its ensemble cast, which included Robert DeNiro and Joe Pesci (in Oscar-winning mode as Tommy), Paul Sorvino, Lorraine Bracco, and an early appearance by Samuel L. Jackson, as well as for lending its name to a range of frozen pizzas…The long tracking shot, where Scorcese’s camera follows Henry as he walks down the back stairs of the Copacabana nightclub, through the kitchen and into the bar, has been much admired and imitated. 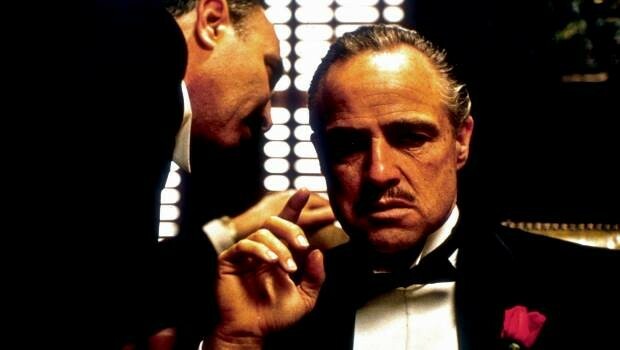 That rarest of beasts, rather like a unicorn – a sequel that is artistically equal, or even superior to, the original film, The Godfather Part 2 continues the story of the Corleone family and also portrays the rise to power of the young Don Vito Corleone, here portrayed by Robert DeNiro. Al Pacino’s performance as Michael Corleone has generally been considered his finest and one of the best performances of all time, while the film won six Academy Awards including Best Picture. Paramount were unwilling to name the film ‘Part II’ but were convinced to change their minds by Coppola – thus beginning the Hollywood tradition of numbered sequels, such as The Madness of King George III. Before Pacino, there was Cagney, who made his name in the gangster genre. Here he plays Cody Jarrett, the ruthless and deranged leader of a criminal gang. Like The Godfather, it garnered a positive reaction on its release and is today considered a classic; Cody’s line ‘Made It, Ma! Top of the world!’ is ranked 18 on the American Film Institutes list of the greatest movie quotes. The movie anticipated many of the developments in film-making that characterized the films of the fifties, including the heist genre, semi-documentary style, and film noir elements, especially the femme fatale character, here portrayed by Virginia Mayo, the cinematography and the twisted psyche of the gangster. No, not Al Pacino’s Scarface – that comes later. This is the Howard Hughes version, starring Paul Muni and George Raft, based on the life of Al Capone, who apparently liked the film so much he owned a copy, just like Victor wossname from those ads (come on, you know the ones). Scarface was greeted with disapproval by the censors, so Hughes, being rich, bought the film back into production to shoot an alternate ending in which Tony is hanged after giving himself up to the police. The censors rejected this ending as well, so Hughes released the film with the original ending, to great box office and positive reviews. Premiered at Cannes, Pulp Fiction caused a sensation, won the Palme d’Or, and made Quentin Tarantootie a household name. Unusually for what might have been considered an arthouse film, after playing at a number of festivals it opened on over 1000 screens in the US and was an immediate box office and critical smash, reviving the careers of John Travolta and Bruce Willis and cementing the reputations of the Weinstein Brothers as marketing geniuses (Pulp Fiction cost $8.5 million to make and grossed nearly $213 worldwide); it could be said that the film changed the rules of independent filmmaking. It’s also a smashing piece of entertainment that showcases all Tarantino’s trademarks – great soundtrack, snappy dialogue, mixture of humour and violence, and pop culture references. The non-linear structure has been much imitated, and the film is hugely influential still – catchphrases are now iconic (Royale with cheese, anyone?) and Mia and Vincent’s dance has been frequently homaged. A pig is still a filthy animal. And Zed’s dead. Cagney’s second appearance in the top ten, this time for playing Tom Powers, a young man rising in the criminal underworld in prohibition era urban America. The film was made before the introduction of infamous Hays Code, and was recut for its 1941 re-release. Three scenes were removed, including one of two characters rolling around in bed – too shocking for words! (This had long been believed lost, as Warners had discarded the original footage in the 1950s, but has now been restored to the DVD). Even better, a prologue was added to the 1954 re-release, advising that gangsters were a menace… The film made a star of Cagney, and created the image of him as a tough guy. ‘Mother of Mercy, is this the end of Rico?’ Edward G. Robinson’s famous line should be enough to set alarm bells ringing – people who talk about themselves in the third person are often a bit odd. Unlike many of the other gangster films, Little Caesar has a clear message that crime doesn’t pay – while Rico dies poor and alone, his friend Joe, played by Douglas Fairbanks, Jr, who has pursued a legitimate career as a dancer, finds fame, fortune, and the love of a good woman. Little Caesar was another film considered worthy of a warning prologue. This is the one you were thinking of – Pacino starring in Brian De Palma’s remake of the 1932 film, written by Oliver Stone. The story is very different – our hero is Tony Montana, a Cuban refugee, who becomes a gangster against the backdrop of the cocaine boom of the 1980s. It has a very eighties feel, a shallow decadence enhanced by its Miami setting – all flash and loads of cash – which is initially very appealing. The film has a strong anti-drugs message; like Rico, Tony rides very high only to crash, a neat metaphor for cocaine addiction. Allegedly.